Rising 200 feet above the valley floor, this massive sandstone bluff has been a traveler’s landmark for thousands of years. People of the ancestral Puebloan culture began construction of two villages atop the bluff around A.D. 1375. They incised figures, birds, and geometric designs along the cliff. Spanish expeditions in the 16th century rested at El Morro during their travels. They, too, left markings. As the United States expanded to include the southwest in the late 1700s and 1800s, U.S. military expeditions sent to explore the new territory also spent time at the bluff. Artists and soldiers left their own inscriptions. 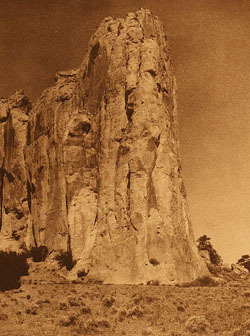 To preserve the site and the rock inscriptions telling the story of El Morro’s past, on December 8, 1906, six months after signing the Antiquities Act into public law, President Theodore Roosevelt established El Morro National Monument for being “of greatest historical value” (Proc. No. 695). Its boundaries were changed on June 18, 1917 and on June 14, 1950. Today, over 57,000 visitors every year come to El Morro National Monument to explore its 1,279 acres. They hike Inscription Trail to view the inscriptions and the ancestral Puebloan ruin called “Atsinna,” or “place of writings on rock.” El Morro’s archeological collections include almost 22,500 objects ranging from the prehistoric ceramics of Native American peoples to pottery, implements, handcrafts, weapons and religious items objects dating to the 17th to the 19th centuries. The collections also contain artifacts belonging to Spanish explorers and southwestern historic artifacts. Some of these objects can be seen in the visitor center. Archeological work continues at El Morro to investigate its past and help work towards its stabilization of the resources.